Roee Rosen, artist, writer and lecturer, was born in Rehovot, Israel, in 1963. He studied art in New York, where he lived for 12 years, and has taught at Tel Aviv University, the Open University and various colleges. His work has been displayed at museums all over the world. In 1997, Rosen held an exhibition entitled "Live and Die as Eva Braun" at the Israel Museum which aroused public controversy. However, it won critical praise for its new approach to Holocaust memory representation and was exhibited at the Jewish Museum in New York in 2002. 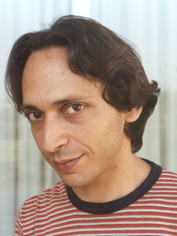 Since 1998, Rosen has devoted his time to the work of Justine Frank, a fictitious artist who is the subject of his first novel, Sweet Sweat. Justine Frank`s work has been exhibited in Italy, Spain and the U.S.A.